We will now focus on Turbulence Modelling, which is a critical area for any engineer involved with industrial CFD. There are a number of different approaches so it is important that you have solid grounding in this area to enable you to choose the appropriate model for your simulation requirements. 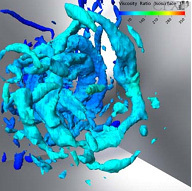 It is worth noting that in August 2012, LEAP will be hosting Dr. Florian Menter to run a series of Advanced Turbulence Training courses in Melbourne, Sydney and Perth. Dr. Menter is a world recognised expert in turbulence modelling, and more information on his visit to Australia can be found here. The ANSYS CFD Solvers solve the Navier Stokes and conservation equations, but as direct solutions are not possible to resolve for any flows of an industrial Reynolds number then we need to do some modelling, as opposed to resolving the values directly. The equations that we used are not closed and so we need to use Turbulence Modelling to close the equation set and then iterate towards a solution. We can use what is called a Reynolds Averaged Navier Stokes (RANS) approach, or we can use an Eddy Simulation technique which resolves the larger eddies in the flow and is only really required when you have separation or large recirculating regions. The most commonly used models are the RANS models due to their low cost in terms of compute power and run times. The Eddy Simulation methods can be quite mesh sensitive but will yield much better results for separated and recirculating flow, albeit over much longer run times. The RANS models apply a Reynolds decomposition technique to the Navier Stokes equations which breaks the velocity down into its mean and fluctuating components. This decomposition leaves us with one unknown value, which is termed the Reynolds Stress. We use Turbulence Models to resolve the Reynold’s Stress and close the equation set. There are two ways we can go about resolving this, the first (and most commonly used approach) is to use an isotropic value for the turbulent viscosity value which is called the an Eddy Viscosity Model, the other way is to solve using the Reynolds Stress Model (RSM) for the 6 separate Reynolds Stresses, which results in an anisotropic solution. The limitation with Eddy Viscosity models is that they use an isotropic value which may not be appropriate and hence can increase the diffusion in your result. Obviously solving for the 6 Reynolds Stresses and dissipation will be more accurate, but you are then solving extra equations which will increase your run time considerably. There are further modifications to the 2 equation Eddy Viscosity models that yield similar results to RSM which I will elaborate on soon. I have listed below the most commonly used Eddy Viscosity turbulence models over the past ten or so years and the intended use behind their development. Spalart-Allmaras – One equation model for attached aerodynamic analysis. k-epsilon – Two equation model for free shear and non-wall bounded flow behaviour. Was the previous industrial standard. k-omega – Two equation model for wall bounded flows, not commonly used. SST (Shear Stress Transport) - Two equation model blending the freestream advantages of the k-epsilon model with the wall bounded advantages of the k-omega model. This is the new industrial standard and should be the default choice for most applications. Note: Modifications for Curvature Correction to the SST model give comparable results to RSM and the SST model also works very well with the Transition Model now available in CFX and FLUENT. Options like Curvature Correction are very useful in tackling problems where previously you would have required an RSM model. The Transition Models can be of benefit also, depending on your application and give much better drag prediction as they will maintain laminar flow along a body and develop natural transition points, as well as calculate regions of bypass transition. I won’t discuss these here, but there is extensive information in the ANSYS User Guides. These additional options are available in ANSYS CFX and ANSYS FLUENT. The Reynolds Stress models were used widely for high swirling flows, for example, the flow in a cyclone separator. In the past we would use the RSM models for this type of flow, but nowadays you should use the SST model with the Curvature Correction model enabled. 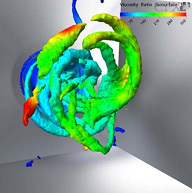 The more advanced options for resolving turbulence are the simulation based models. These generally require much better mesh resolution and involve much longer run times as they can only be run as an unsteady simulation. These are used primarily for resolving large scale separations and recirculating regions. The Scale Adaptive Simulation is the best point to start when stepping up from a RANS modelling analysis. The Scale Adaptive Simulation is based on an unsteady SST RANS model but calculates the local length scales and resolves accordingly. The advantage of this is that it can be run on a good quality RANS mesh without any additional meshing requirements. For some flow behaviours this has been shown to give very similar results to Large Eddy Simulation (LES) and Detached Eddy Simulation (DES). This is why we would recommend this as a starting point for unsteady simulations with separated or recirculating flows, and as a good alternative to an unsteady RANS SST simulation. The Detached Eddy Simulation resolves the boundary layer and the smaller eddies by using a RANS solution in those regions. This can produce quite good results for a fraction of the cost of LES, but is very sensitive to the mesh resolution. You need to ensure a very good quality mesh in the boundary layer and a good transition region from the boundary layer to the freestream to help the solver switch from the RANS solution in the boundary layer to an LES solution for the larger eddies. This adds complexity and has been known to cause erroneous results. Large Eddy Simulation is the most expensive of the three simulation options and requires a very fine grid to accurately resolve the eddies, especially in the boundary layer. Once the eddies are too small to be resolved by the grid, they fall back into a sub-grid model. As this sub-grid model is used only to resolve the smallest eddies which tend to have more universal properties, this yields very accurate results, but because of the large mesh requirements this is not a commonly used approach in industrial settings. We can now use LES in specific regions of the mesh only using Embedded LES. This means that we can run an unsteady RANS in the bulk of the flow and a full LES calculation in only the required separated regions hence making it more practical for industrial use. Each of these simulation methods when used correctly will yield a better result than the steady state or unsteady RANS models for separated flow or recirculating flow behaviour but it is more expensive to do so. As far as Turbulence Models are concerned, the SST is a good default choice for most flow problems. Please contact our Technical Support Team if you would like to discuss your flow problem and the options available to you. If you are interested in attending the Advanced Turbulence Training courses by Dr. Florian Menter, more information can be found here. In the next blog post we will look at the importance of the y+ value and discuss the use of appropriate values for the different turbulence models. I am dealing with the following problem: Gas flows through a tube with different internals which (abruptly) reduce the flow cross-section and redirect the flow in some parts of the flow domain. The flow is laminar at the inlet, but I do not know if it changes to turbulent somewhere downstream. What kind of turbulence treatment would you suggest to use in a CFD analysis of such a situation? The downstream Reynolds number should give a good indication of the flow regime. The appropriate turbulence treatment will very much depend on the outputs that are relevant to you. In general, the k-w SST model is applicable to a wide range of industrial problems. Whether you resolve the boundary layer or use wall functions will depend on the importance of wall bounded flows to your system. This is really worthwhile and lucid information about turbulence which cleared my confusion like when to use which model. Thanks for that. You are saying that making curvature correction in SST model will give results comparable to RSM (Reynold Stress Model). My doubt is does SST model take anisotropic effects in account like RSM? My flow is having strong swirl at the inlet of the domain ( which is outlet of turbocharger). Could you please tell me which model would be suitable for my flow physics? Thanks. Although the curvature correction does not take anisotropic Reynolds stresses into account, it does sensitize the other RANS models to streamline curvature and system rotation. A more complete discussion can be found in Section 4.15 of the Fluent Theory Guide. If the anisotropy of the Reynolds stresses is an important quantity for your simulation, then clearly the RSM would be the more appropriate choice. If your primary interest is in accurately capturing the flow curvature and its effect on the system however, the SST with curvature correction has been shown to give comparable results and is typically much easier to converge. The value for the first cell height is based on a number of items such as the Reynolds Number, characteristic length, and fluid density. The Turbulence blog series highlights a lot of significant factors that go into predicting, modelling, and capturing the proper boundary layer and I would highly recommend taking a look there as a first go! Our Tips & Tricks blog on Y+ requirements can provide you with a first estimate of a first cell height for a given velocity, length and density. The turbulence model choice will depend on what you are looking to model; however, the Shear Stress Transport Model is a great baseline to start your investigation from and to build upon.